Storj, the Blockchain-based cloud storage service, has released a new version 0.5 of their DriveShare GUI and we have decided to give it a try after keeping an eye on the development of Storj and their StorjcoinX (SJCX) crypto currency tokens. The DriverShare GUI is still an alpha build and the company is still testing it with the help of users by rewarding the participants with SJCX coins, though there is a catch – you need to have and use a wallet with at least 10000 SJCX coins in it in order to be eligible to receive any rewards for this test. So started from scratch by making a SJCX wallet, going through exchanges to buy at least 10000 StorjcoinX coins and installing and running the latest DriveShare GUI and below you can find our not so pleasant experience as well as details of what you actually need to do, how and where if you want to follow in our footsteps. You need to start by downloading the latest DriveShare GUI, it is available as binaries compiled for Windows, Mac OS X and Linux as well as a source code. This is the software you need to install and run on your computer to share some space in order to participate in the current test run of the service. 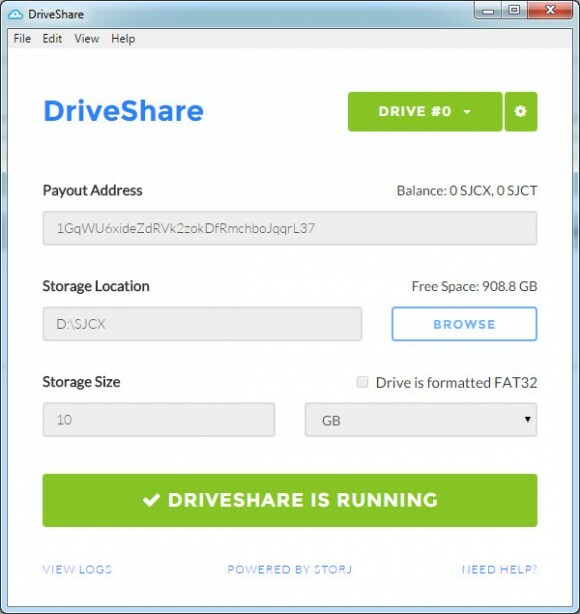 The DriveShare GUI software is actually the easiest part, but as you will see after installing and running the software you will also need to create a Payout Address where you will need to also store at least 10000 SJCX coins in order to get rewards for your time and resources spent in helping test the service. The official website recommends that you create a wallet address for SJCX at Counterwallet – the official web-based Counterparty Counterwallet server. It is recommended that you do not use a wallet address for SJCX that has been generated in an exchange as there you do not have control over the address and do not posses the private key for your wallet and that can cause you all kinds of trouble. As soon as yo register at the Counterwallet you will get a unique wallet address and this address is universal and will work for Bitcoin (BTC) and Counterparty (XCP) as you will see in your wallet dashboard, but what about SJCX? What is not very clearly stated however is that the address you get is also for StorjcoinX (SJCX) as well and as soon as you transfer some coins to it you will see another box added for SJCX. This can cause a bit of a confusion for users that are using the Counterwallet and are not very familiar with it as well as the SJCX and unfortunately it is not very clearly explained on the StorjcoinX website, they do point you to an user video that actually explains this with not official more detailed explanation. Still once you get your wallet and do send some small amount of coins to try things out you will pretty much understand how things work with Counterwallet and StorjcoinX. Do note however that if you want to send out SJCX coins from your web-based wallet there will be a fee of 0.0005 BTC to perform the action or roughly about $0.225 USD. This is the standard fee and you cannot pay the fee in SJCX, only in BTC, so you will also need to have a small amount of Bitcoins in the wallet in order to be able to cover the fees. Also make sure that you use the Show Private Key option in the wallet and save the wallet address and the private key for it in a secure place in case you need to recover it at a later time. The next step is to buy some StorjcoinX from one of the exchanges that does have SJCX markets, since the service backed by the tokens is still in testing period it is to be expected that there are not many exchanges supporting it. You can buy from two of the biggest altcoin exchanges – Bittrex and Poloniex as well as from services such as ShapeShift or even from the Counterwallet. Unfortunately the market at Counterwallet is not very active and the pair SJCX/XBTC (StorjcoinX/Bitcoin) does not have any buy or sell offers at the moment, so it is not very usable. ShapeShift is a convenient service that allows you to exchange between multiple crypto currency pairs without even having to register, but the exchange rate there is usually not the best. So you need to go to an exchange and buy the 10000 SJCX coins from there, leaving you the two options currently available – Bittrex and Poloniex. We have started with Bittrex, however we soon found out that the SJCX volume there is too low and buying 10000 StorjcoinX from there would mean that we would have to spend much more than the average price. So we just bought a few hundred coins to try the Counterwallet and the transfer was quick and problem free from Bittrex to the Counterwallet. Then we have moved to Poloniex to buy more coins as apparently the exchange of choice and with the largest volume for SJCX is precisely this one, we have bought a little over 13000 SJCX with an average price of about 3600 satoshi per SJCX and then tried to withdraw them in a single transaction to the Counterwallet. Unfortunately the withdraw did not complete successfully, we got an error message, so we’ve written to the support at Poloniex and a few hours later we’ve had the SJCX coins available back in the account. We have initiated another withdraw request, but unfortunately it did not go through either, so we are waiting again for the support to resolve the issue. If we get back the coins back in our account we are going to try to withdraw them at smaller portions again and if these do not go through again, then it would seem that Poloniex might have some issue with SJCX at the moment which will not be very good at all. The issue with Poloniex withdraws of SJCX was resolved by the support and the coins are now in our wallet. All in all, even though the things are still in testing period, there is still much work needed to be done to make everything more clear and user friendly to new users as the goal of such a service is to become mainstream in order to be successful. Storj has a great idea and they are doing the software implementation quite well already, but they also need to work on other parts of the ecosystem such as the wallets and the exchanges as apparently these are farm from what they should be in terms of ease of use and being problem free for the users. Hopefully by the time everything is ready for an official launch things will be improved further and they will be easy for everyone that wants to take advantage from the ideas behind this Blockchain-based cloud storage service.